Bathroom faucets have undergone a design evolution since the days when your choices were limited to one handle or two in chrome. For retro and rustic look bathrooms, the faucets can reflect the décor and your own personal style. Other bath accessories, such as drawer pulls, towel racks, and tissue roll dispensers can complete the look. Metallic finishes now run the gamut of traditional silvered chrome, brushed stainless steel, or darker oil-rubbed bronze with accents in copper tones. On Delta’s website, a feature-based search tool allows you to pick from eight finishes; single or double handles; “smart features;” price; and different configurations, like center set, wide spread or wall mount. The “smart features” include options like conserving WaterSense labels; Touch2O, where controls are operated through touching the fixture; or ADA compliant for ease of use. Once the features are selected, the website will display the models that have the features selected. A hint: to get a wider selection to view, use just one or two feature selections. 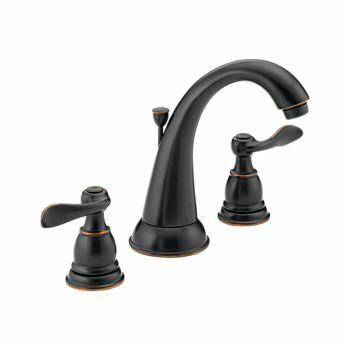 Kohler offers faucets that coordinate ceramic and decorated faucets with matching ceramic sinks. 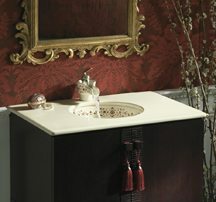 One combination called Maharani offers several distinctive designs with matching ceramic under counter lavatories. In selecting the faucets, you should also consider the people in your household who will be using the appliances. A faucet mount with small handles mounted closely together may be hard to manipulate with larger hands or those with arthritis. Some people find that the double handles allow better temperature control, while others feel a single handle faucet controls water flow better. Whatever combination of features you desire, there is certainly a faucet that will meet your needs!